Would love to know what cheap(er) chic gift finds you have! Oh, so many great selections! I posted a few things from Garnet Hill today and they have a great letterpress wall calendar for just $48. Love this collage! OH that dress, that clutch and those slippers!! P.s.Just a quick note to remember you the lovely Christmas Giveaway on Sweet as a Candy! Good luck! Love that clutch and the slippers. Great color palette too! Great job. I am such a girly girl and these represent that perfectly with out being over the top. awww.... that apron is perfect! sigh, I loveeee that clutch and those slippers!!!! fabulous! I totally popped into Anthropologie to load up on the aprons as gifts for my girls (post scheduled for Wednesday :D) -- but that cream/gold one is seriously killer-glam! Fab picks, all of these though! that apron looks like a holiday dress! fantastic! Put on the apron, with heels, and nothing else and bake up some holiday fun for the mister! Gorgeous options, darling B! Love that teapot! Love this! Just what I needed to get shop-inspired. Gorgeous gift ideas, Blair. My girlfriends and I take part in a gift exchange as well. It's a great excuse to all get together and have a great time giving gifts. Christina: You are right! I was thinking to myself how pretty that 'dress' was, and was surprised to read it was an apron. slippers are devine. Chai sopa sounds lovely too..... ooh thank you for your great blog ! how fun! that apron is sooo stylish! I <3 anthro. These are lovely finds. 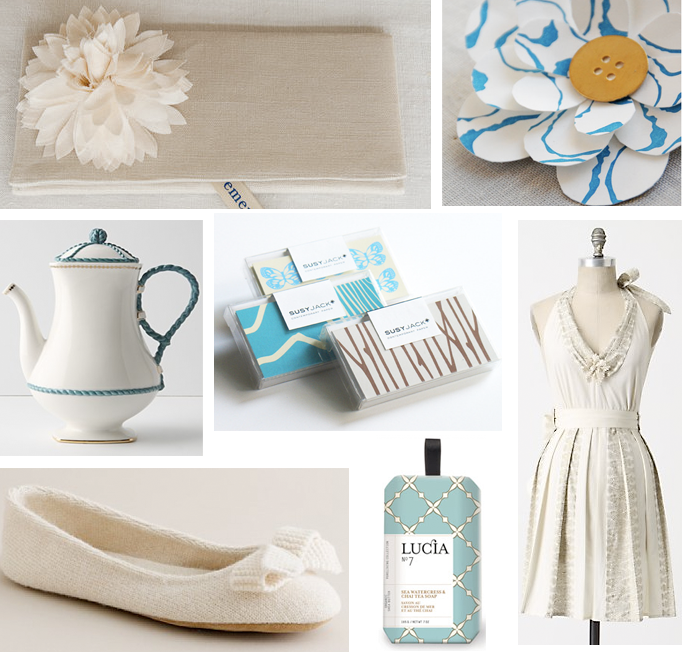 I have picked up some of the "Lucia" products already; they're perfectly girly and a pretty little gift. (I love that stationary, too. I'm off to see more). I've utilized etsy for my gifts-for-girlfriends this year and it's an amazingly cost-efficient method of buying lovely personalized gifts. cuuute! I thought the apron was a dress and I was going to jump on getting it - darn! I love it all though! I would take any of these. The apron is so pretty and I've been wanting those slippers. Wow! This is stunning beyond words! Well done! I got the emersonmade clutch in navy with a mustard colored flower and have had so many compliments on it! I just shot her house for Country Living and it will appear in the May 2010 issue!